"This is a longtime favorite of my family -- even the most selective 'diners' like it! 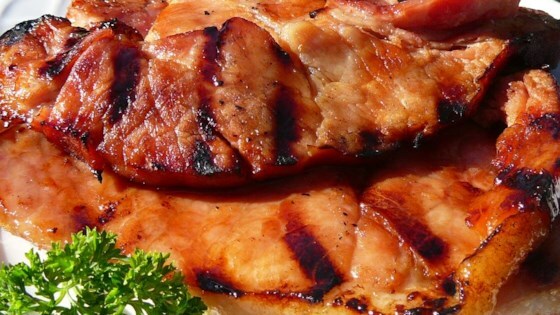 Cooked ham is basted with a warm, zesty sauce while grilling. Smoked turkey slices may be substituted for ham." This ham is delicous!!! I made it on the stove top and cooked the ham in it. I halved the recipe and it worked just fine too. Highly recommended. Made this as a last minute thing, it is amazing!!! Had it again tonight for dinner, very easy, very quick, nice and tangy! excellent...but i LOVE horseradish sauce...i would add MORE! but as written, terrific. i believe folks that don't like horsey would like this. i used fresh lemon squeezed . try this! Yum. Careful...pending on the thickness of your slices, you may not need the entire grill time! Tasty and easy! Thanks Doreen. Yummy! I used this marinade and baked the ham while it was sitting in the juice/sauce. I didn't have enough lemon, so I added some orange juice. Very good!